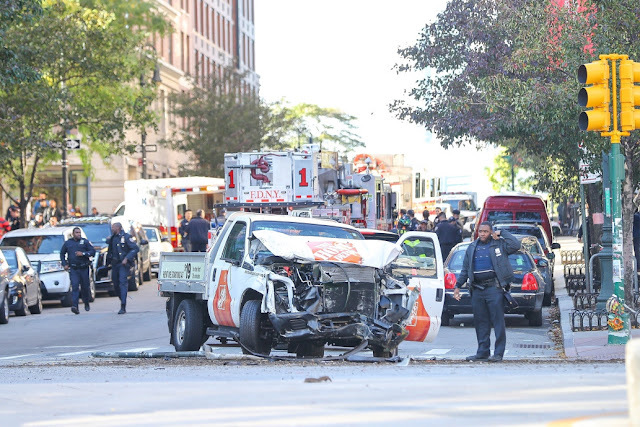 Eight people are feared dead after a truck ploughed into innocent victims on bicycles near Ground Zero in New York City and screaming allahu akbar. The suspect, who was shot by police, ploughed his car into up to 23 people on a cycle path, killing eight and injuring more than a dozen others, according to cops. A man who emerged from the vehicle brandishing imitation guns was shot and arrested by police officers. US police describe the incident as a terror attack, with reports saying the FBI is now leading the investigation.